In previous tutorials, everything revolved around the concept of nodes. Scenes are collections of nodes. They become active once they enter the scene tree. The way Godot works internally is as follows. There is the OS class, which is the only instance that runs at the beginning. Afterwards, all drivers, servers, scripting languages, scene system, etc are loaded. When initialization is complete, OS needs to be supplied a MainLoop to run. Up to this point, all this is internals working (you can check main/main.cpp file in the source code if you are ever interested to see how this works internally). The user program, or game, starts in the MainLoop. This class has a few methods, for initialization, idle (frame-synchronized callback), fixed (physics-synchronized callback), and input. Again, this is low level and when making games in Godot, writing your own MainLoop seldom makes sense. One of the ways to explain how Godot works is that it’s a high level game engine over a low level middleware. The scene system is the game engine, while the OS and servers are the low level API. 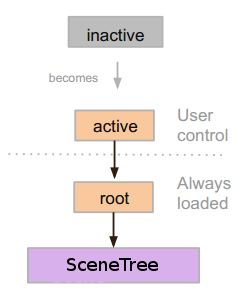 The scene system provides its own main loop to OS, SceneTree. This is automatically instanced and set when running a scene, no need to do any extra work. It contains information about the groups and has the means to call all nodes in a group or get a list of them. It contains some global state functionality, such as setting pause mode or quitting the process. When a node is part of the Scene Tree, the SceneTree singleton can be obtained by calling Node.get_tree(). get_tree().get_root() # Access via scene main loop. get_node("/root") # Access via absolute path. GetTree().GetRoot(); // Access via scene main loop. GetNode("/root"); // Access via absolute path. This node contains the main viewport. Anything that is a child of a Viewport is drawn inside of it by default, so it makes sense that the top of all nodes is always a node of this type otherwise nothing would be seen. While other viewports can be created in the scene (for split-screen effects and such), this one is the only one that is never created by the user. It’s created automatically inside SceneTree. When a node is connected, directly or indirectly, to the root viewport, it becomes part of the scene tree. This means that as explained in previous tutorials, it will get the _enter_tree() and _ready() callbacks (as well as _exit_tree()). When nodes enter the Scene Tree, they become active. They get access to everything they need to process, get input, display 2D and 3D visuals, receive and send notifications, play sounds, etc. When they are removed from the scene tree, they lose these abilities. Most node operations in Godot, such as drawing 2D, processing, or getting notifications are done in tree order. This means that parents and siblings with a lower rank in the tree order will get notified before the current node. A scene is loaded from disk or created by scripting. The root node of that scene (only one root, remember?) is added as either a child of the “root” Viewport (from SceneTree), or to any child or grandchild of it. 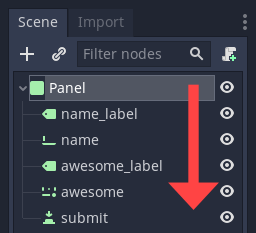 Every node of the newly added scene, will receive the “enter_tree” notification ( _enter_tree() callback in GDScript) in top-to-bottom order. An extra notification, “ready” ( _ready() callback in GDScript) is provided for convenience, when a node and all its children are inside the active scene. These are quick and useful ways to switch scenes but have the drawback that the game will stall until the new scene is loaded and running. At some point in the development of your game, it may be preferable to create proper loading screens with progress bar, animated indicators or thread (background) loading. This must be done manually using autoloads (see next chapter) and Background loading.